Love Modesto started with two questions back in 2007 – Why is our city on some of the “worst cities in America” lists? What if our churches were to suddenly disappear from the Modesto area, would anyone even care or notice? With a lot of dreaming and planning came March 7, 2009. Over 1,200 people showed up to love our city in practical ways. We’ve done this six more times since adding Love Ceres, Love Escalon and Love Riverbank in 2011. Over 11,000 people have been a part… young, old, abled, disabled, people from a church or no church at all. Over 38,500 volunteer hours have been donated – at minimum wage, this is over $308,000! At these community wide service days, volunteers engage in a variety of projects such as offering food to the hungry, visiting convalescent homes, donating blood, building a house with Habitat for Humanity and working with the city parks, among other opportunities. 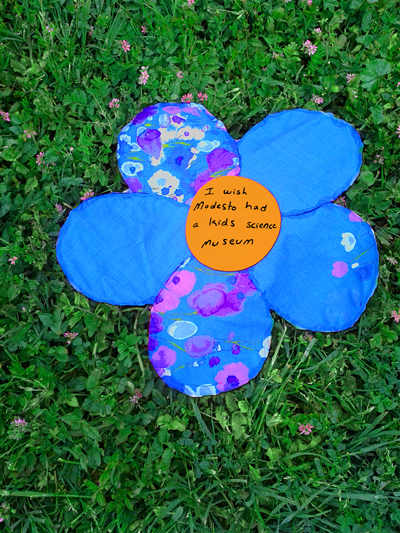 The Dream Garden project allows the public to create fabric flowers from used clothing, and then write their personal dream in the flower’s center, transforming a craft piece into a collective statement about the dreams of residents in the community. The April 28, 2012 event has over 70 volunteers contributing to the project. Strolling through the completed garden gives viewers personal insight into the goals and desires of their own neighbors. The final project is created through the direct participation of Modesto residents, and most importantly, the art gives residents the opportunity to see how they could transform their community. The Dream Garden will be on display at various locations around our community.